The log is where Cyrus keeps track of important events and observations during his adventures. You can view its contents by pressing the L key (default). The up and down arrow keys scroll the page if there are enough entries. Each entry is written down when some event occurs or during dialogue, but only once if you repeat dialogue topics. A small animation of a quill writing on parchment indicates that a new entry has been added. The table below lists all of the possible entries and the conditions required for them to appear. Favis says the bell is broken. Examined bell, and it seems to be in perfect working order. Climb up and inspect the bell after asking Favis: "Broken Bell"
A young Yokudan named Hayle was killed by the Imperials. Avik calls it murder. Hayle's family camps outside the city waiting to complete the burial ritual. Avik: "Yokudan Lad"
Men from the Restless League came around and asked Avik about a woman after Hayle's death. Avik told them nothing, but he reveals that he saw Hayle and Iszara together on the day Hayle was killed. Avik: "Told Them Nothing"
Hayle was born under the sign of the serpent. Avik says that Yokudans believe that the stars guide your destiny from birth to death and beyond. Avik: "Sign of the Serpent"
Hayle's mother, Saban, can't complete the burial ritual for the murdered boy because she has to protect his spirit from the soul snare set by N'gasta. This soul snare, according to Avik, sends the spirit of the departed to N'gasta unless the victim is buried in consecrated ground. Avik: "Soul Snare"
Joto, a member of the Mage's Guild and Avik's friend, was arrested by the Imperials. Avik: "Mage's Guild"
When asked for directions to the Draggin Tale, Captain Brennan said to go up the bridge on the right, through the gate to the town square, and look for the sign. Brennan: "Draggin Tale"
The young Yokudan, Coyle, says that Iszara came with his wounded brother Hayle to Saban to ask for help on the day Hayle was killed. Iszara tried to explain, but Saban was too upset to listen. Coyle: "Hayle's Death"
Coyle says the necromancer N'gasta has set a soulsnare over the entire island of Stros M'kai. Anyone who dies without the proper ritual has his soul carried to N'gasta's tower to serve the necromancer. Coyle: "Necromancer"
Coyle says his mother Saban can protect his brother Hayle's soul from N'gasta because she is a powerful witch -- the most powerful witchmother of her tribe. Coyle: "Soul Snare"
Coyle says his mother is a powerful sorcerer, and could easily guide her son Hayle's soul past N'gasta's soulsnare, except that Hayle was born under the sign of the serpent. The other twelve constellation follow the circles of heaven, but neither Coyle nor his mother know how to predict the serpent's path. The only way to guide Hayle's soul through the soulsnare is to place the starstones in the positions of the serpent's head and tail. Coyle: "Serpent"
Coyle tells of the three circles of the heavens, and of the three guardians that protect their three charges, each to its own circle of heaven. Coyle: "Guardians and Charges"
Coyle recited the verse concerning the Warrior Guardian: 'Strong Warrior Charges... Steed Prancing... Lady Dancing... Lord Advancing... Through The Night.' Coyle: "Warrior"
Coyle recited the verse concerning the Mage Guardian: 'Wise Mage Orders... Apprentice Learning... Ritual Turning... Golem Burning... Through The Night.' Coyle: "Mage"
Coyle recited the verse concerning the Thief Guardian: 'Clever Thief Watches... Lover Sighing... Shadow Lying... Tow'r Defying... Through The Night.' Coyle: "Thief"
Crendal says he has a piece of the map to the Flask of Lillandril. Crendal: "Flask Map"
Crendal says he got a piece of a map to the Flask of Lillandril by stealing it. He says he found it under a cot on Trithik's boat. Crendal: "Have Map Piece"
Crendal says he has hidden his piece of the map to the Flask of Lillandril where others can't find it. Crendal: "Trade for Map"
Dreekius says Captain Brennan is looking for me. 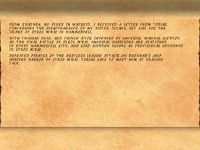 Dreekius: "After Escape the Catacombs"
Dreekius says a Breton drunk, Crendal, bragged about having a piece of a map to the legendary Flask of Lillandril. Dreekius: "Lots of People"
Erasmo raves about ghosts in the Saintsport lighthouse keeping him awake all night, blinking 'flash, flash, flaaaash'. Erasmo: "Ghosts"
Erasmo claims he's fixed the orrery, but that he can't fix the telescope because he's missing a gear. He says he tried to fix the telescope, but he burned his legs down in the gear room. Erasmo: "Burn Your Legs"
Erasmo says a dwarven gear is needed to fix the telescope -- not just any gear. Erasmo: "Gear"
Erasmo says he won't go down to the gear room. Go to the gear room and install the gear on the far side to fix the telescope. Erasmo: "Give Gear"
Erasmo is pleased that the telescope is fixed. Erasmo: "Telescope Fixed"
Falicia says she heard that the map to the Flask of Lillandril was torn into four pieces. She says one piece was inscribed on the bottom of a silver box shaped like a ship. Falicia: "Flask Map"
Favis says a fellow in the watchtower, Prnell, waves a flag when a ship arrives, signaling Favis to ring the bell. Favis complains that Prnell never lets Favis have a turn waving the flag. Favis: "Flag"
Favis says the bell is broken, or it doesn't ring as loud as it used to. Favis: "Broken Bell"
Gerrick worries that Iszara might have sought to find malachite through the Smuggler's Den. Gerrick: "Knows More"
Gerrick thinks that the Restless League is connected with the smugglers operating out of the Smuggler's Den beneath the Cartographer's shop. Gerrick: "Smuggler's Den"
Gerrick says that Rollo is supposed to fetch shipments from the harbor whenever he hears a bell rung by a fellow named Favis. Ringing the bell announces the arrival of a ship. Gerrick: "Bell"
J'ffer says that, according to legend, a stable boy armed with the Flask of Lillandril defeated the High Wizard of Valenwood. The device may then be a potent anti-magic device, perhaps one which absorbs magic. J'ffer: "Anti-Magic"
Kotaro says Draggin' Tale on town square; follow ramps uphill. Kotaro: "Draggin Tale"
Kotaro identifies N'gasta as a harmless old hermit living in the old wizard's tower on the shoals along the northwest side of the island. Kotaro: "N'Gasta"
The governor's palace is 'straight at the top of the hill... the grandest structure in Stros M'kai' -- according to Kotaro. Kotaro: "Governor's Palace"
Kotaro says that superstitious locals call N'gasta a necromancer. Kotaro: "Superstitions"
Accepted job from Kotaro to deliver amulet to Governor Richton on behalf of N'gasta. Pick up amulet from N'gasta. Paid 100 gold; collect balance of 200 gold from Kotaro after delivery. Kotaro: "I'll Take the Job"
Paid by Kotaro for amulet delivery. Kotaro: "Finished Job"
Krisandra says Lakene, a local handyman, came to her to replace an antique silver locket of his wife's that Lakene lost while gambling in the Smuggler's Den. When Krisandra said she couldn't help him, he was quite distressed. Krisandra: "Lakene"
Krisandra gave me a key and invited me to search her storehouse for a silver ship inscribed with a piece of the map to the Flask of Lillandril. If I find it, she says to keep it. Krisandra: "Map to Flask"
Lakene says the Imperial's [sic] are searching for the ancient technological treasures of the Dwarves in the ruins in the mountains. Lakene: "Mystery"
Lakene says he'll give the password, but only if I get his wife's locket back from Rollo. Lakene: "Give Me Password"
Delivered Lakene's wife's locket to him, and received the password to the Smuggler's Den in return. Password is 'spoon'. Lakene: "Give Locket"
Maiko agreed to make a detailed map using the map notations from the book 'Elven Artifacts'... but in return Maiko gets to keep the book. Maiko says to come back in a while for the map. Maiko: "Book for Map"
Mariah says the Restless League might be contacted through the Smuggler's Den. Mariah: "Contact League"
The park is over by the waterfall, Mariah says. Mariah: "Park"
Mariah recalls that she saw the Arkay boy, Kithral, visiting the park, gazing at the waterfall, and writing in his journal. She also describes him as a 'passionate Crown,' and muses that she hasn't seen him in months. Mariah: "Kithral"
Mariah says she last saw Iszara headed for the Cartographer's. Mariah: "Smuggler's Den"
Iszara is among the living, N'gasta assures you, or he would know otherwise. N'Gasta: "Iszara"
N'gasta grants that the Mage's Guild opposes the practice of his craft, but that the governor favors him over those of the Mage's Guild. N'Gasta: "Necromancy"
N'gasta's soulsnare captures the departed spirits of 'silly folk who neglect the sanctity of their souls'. N'Gasta: "Souls"
The soulsnare captures only those spirits unprotected by holy rituals, or those buried in unhallowed ground, according to N'gasta. N'Gasta: "Thassad"
N'gasta says that the governor is his generous patron, and that the governor's policies bring N'gasta profit. N'Gasta: "Governor"
N'gasta serves the Daedra Lord Clavicus Vile, and says that Vile grants favors in return for each soul N'gasta delivers. N'Gasta: "Daedra Lords"
In passing, N'gasta mentions that there is only one surviving brother of Arkay, that the other became snared in his net three master moons ago -- about the same time that Iszara disappeared. N'Gasta: "Soul Snare"
Nidal says that his former initiate, Brother Kithral, has disappeared. Nidal: "Nationalist"
Nidal says that he last saw the missing initiate, Brother Kithral, heading for the park to collect mandrake roots. Nidal thinks Richton's men are responsible for Kithral's disappearance. Nidal: "Brother Kithral"
Nidal revealed that A'tor's body is hidden in the temple, preserved from decay by a spell of stasis. Nidal suggests that Voa's ring could dispel a stasis field on A'tor's body, but gives no suggestion why Kithral or Iszara would try that. Nidal: "Kithral's Journal"
Nidal says he can't work the soulgem's magic, that a mage is needed. Nidal: "I Have the Gem"
Nidal says he can't work ring's magic, that a mage is needed. Nidal: "I Have Voa's Ring"
From the parrot pieced together the following: 'Pretty sister had her schemes. Needed gold this time, it seems. Twenty-one paces. As the head faces. Buried there the gold still gleams!' Orsone: "Riddle"
Dying Restless League prisoner said something about going to a lighthouse to signal the League. Received a rusty key. Prisoner: "Lighthouse"
Prnell says to contact the Restless League through the Smuggler's Den beneath Maiko's shop, but that I need a password to get in. Prnell: "Smuggler's Den"
Prnell says he has lost an eyepiece. His eyesight is very bad, and he really wants the eyepiece. Prnell: "Eyepiece"
When Prnell sees a ship, he goes out on the walkway and waves a flag so Favis knows to ring the bell. Prnell: "Bell"
Borrowed the flag used to signal the arrival of a ship in harbor from Prnell. Prnell: "Borrow Flag"
A password is needed to enter the Smuggler's Den. Rollo: "Smuggler's Den"
Coyle says that his mother Saban says that it takes a powerful sorcerer to use the power of a soulgem. Coyle assures that his mother is that powerful. Saban: "Soulgem"
Siona says Captain Brennan wants to see me. Siona: "After Escape the Catacombs"
Siona says she is a friend of Tobias, and that she is happy to help me. Answer yes to Siona: "Draggin Tale"
Siona says the Restless League might be contacted through the Smuggler's Den in Maiko's basement. Siona: "Contact League"
Siona says that the governor's palace is just up the hill -- can't miss it -- but not to expect to sneak in. Siona: "Palace"
Siona says Richton is accompanied by a red-eyed, Dark Elf assassin, Dram, from Morrowind. Siona: "Shadow"
Siona says that she heard Imperial Guards talking about Brennan having been paid to set a trap for 'that Redguard the Governor's so hot about'. Siona: "Brennan"
Tobias says that Brother Kithral (a Brother of Arkay) and Iszara both disappeared about the same time, and that they knew each other. Tobias: "Brothers of Arkay"
Tobias says visit Brother Nidal at the temple to learn more about Iszara. Tobias: "Temple"
Tobias says he sails from Stros M'kai at sundown to avoid risk of Imperial arrest. Tobias: "Leaving"
Tobias suspects Richton in Iszara's disappearance. Tobias: "Provisional Governor"
Tobias says his friend Siona down by the docks may be able to help with information about the Crowns. Tobias: "Crowns"
Trithik says any goblins in Stros M'kai are banished beneath the earth of Stros M'kai, thanks to Frandar Hunding. Trithik: "Goblins"
According to Trithik, though Prince A'tor's body was lost at sea, there are already prophecies of his return. Trithik: "Prince"
From Trithik I learned that Prince A'tor had dealings with the Restless League, though the Crowns considered the League untrustworthy. Trithik: "A'tor"
A necromancer's curse affects Stros M'kai. According to Trithik, the shoals when [sic] the necromancer is found lie to the west along a path over a bridge. Trithik: "Shoals"
When I suggested speaking with Richton, Trithik said that no Redguards are admitted to the palace. Trithik: "Richton"
Trithik says that Governor Richton ordered the destruction of the Old Quarter, a refuge of the Crowns, with dragonfire. Trithik: "Old Quarter"
Trithik says he used to have a piece of a map to the Flask of Lillandril, but that it was stolen several weeks ago. Trithik: "Flask Map"
Trithik can only remember that his piece of the map to the Flask of Lillandril bore two numbers, an 'X', and the notation 'long tree'. Trithik: "Crendal" or "Crendal Thief"
The captain of the ship that responded to the League signal from the lighthouse won't cooperate unless she is given proof that I am worthy of the League's attention, sufficient proof to justify the risk of sailing me to the League's hideout. Yaeli: "Proof"
These entries are added by unused dialogue. Dreekius thinks a dragon guards the soulgem in a hoard in a secret treasure vault in the catacombs. Dreekius says a weapontip roasted in dragonfire will pierce a dragon like no other. Dreekius: "The Treasure Vaults"
These are found in the game files, but have no conditions for them to appear in the log. Mariah says she's seen League members coming in and out of the Smuggler's Den below the Cartographer's. Mariah: "Smuggler's Den"
Saban says I might find the Restless League at the lighthouse. Saban: "League"
This page was last modified on 15 August 2018, at 15:49.